Sprint's BlackBerry Curve is Official | BlackBerry Blast! 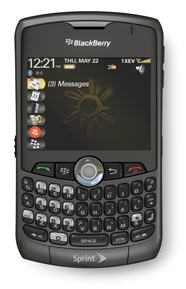 Sprint and Research in Motion have offically announced the BlackBerry Curve 8330. The Sprint BB Curve will have extras that include the Sprint Music Store, Sprint TV, Sprint Navigation, and an open on board GPS. The Sprint BlackBerry Curve will cost $179.99 after instant and mail-in rebates. "Powerful core organizational capabilities, sleek and attractive form factors, exclusive multimedia content, flexible international service options and industry-leading push-to-talk service are combined factors that give Sprint one of the most attractive BlackBerry smartphone portfolios in the industry," said Danny Bowman, vice president of customer equipment for Sprint. "The addition of the BlackBerry Curve 8330 to our lineup gives our customers access to information now, with no compromises." "The BlackBerry Curve 8330 smartphone offers a unique blend of functionality, design and usability that hits a real sweet spot for both personal and professional use," said Mark Guibert, Vice President, Corporate Marketing at Research In Motion. "It's as adept at keeping people productive at work as it is with helping them stay connected to friends or entertained and informed with Sprint's music, video and navigation services."